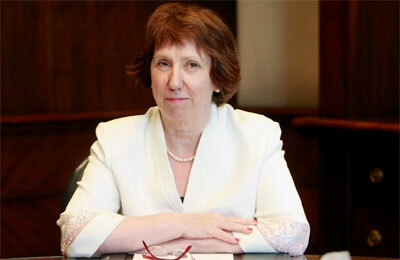 European Union foreign policy chief Catherine Ashton met ousted Egyptian president Mohamed Mursi late on Monday and held two hours of "in depth" discussions, Ashton's spokesperson said. Spokesperson Maja Kocijancic said on her Twitter account that the meeting had taken place, but did not say where. Mursi has been in detention since he was ousted after the military-backed interim government placed the deposed Islamist under investigation on charges that include murder. Ashton is on her second visit to Cairo in 12 days as one of the few outsiders able to speak to both sides in Egypt's political crisis. She is expected to speak to reporters later on Tuesday. On Monday, Ashton met General Abdel Fattah al-Sisi, the head of the army and the man behind Mursi's overthrow. She also held talks with members of the interim government installed by the army, and representatives of the Freedom and Justice Party, the Brotherhood's political wing. Before arriving, she said she would press for a "fully inclusive transition process, taking in all political groups, including the Muslim Brotherhood".